What's the best time to prune shrubs? It depends on the type of shrubbery you have: pruning shrubs grown for their floral displays requires a different mindset than does pruning those grown for their evergreen needles. Even the question of what's the best time to prune flowering bushes, specifically, can't be answered without breaking "flowering bushes" down into two categories. Spring blooming bushes such as forsythia are generally pruned just after they bloom. These are the aptly named "shrubs that bloom on old wood." 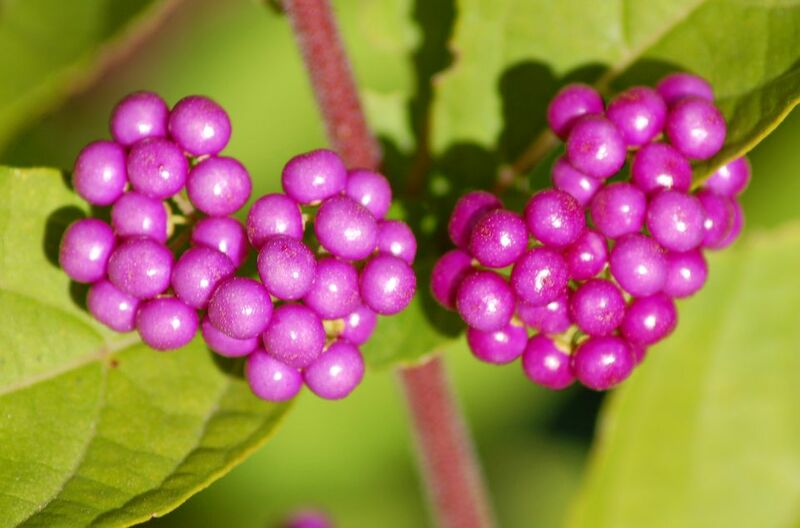 By contrast, you'll want to prune some summer blooming shrubs in early spring, because they bloom on new wood; for example, beautyberry (picture) and bluebeard. Likewise, questions about timing on pruning evergreens can't be answered without first determining whether the bushes to be pruned are needle-bearing evergreens (such as arborvitae) or broadleaf evergreens (such as holly bushes). That issue is addressed in a separate article on the best time to prune evergreen shrubs. When Should You Prune Lantana? USDA planting zone 7 is a borderline zone for the hardiness of lantana shrubs. In some areas of zone 7, lantana leaves stay green throughout the winter. In others, although the plants remain alive (underground), the foliage turns brown in winter. How might this distinction affect a decision regarding the best time for pruning lantana? If lantana is evergreen in your area, it probably makes sense to restrict any heavy pruning to the spring season. You might as well profit from its evergreen quality and enjoy it as a ground cover during the winter season. In other words, it is an aesthetic decision. If, on the other hand, your lantana's leaves turn brown and the plant dies back to bare wood when freezing temperatures arrive in late fall, there is not much point in waiting till spring before pruning. Once the leaves turn brown, take the opportunity to prune your lantana down by as much as to within 6-12 inches of ground level. Vegetation will re-emerge in spring. Lantana is not harmed at all by such a drastic pruning, and the result will be more compact shrubs. When Do You Prune Desert Bird of Paradise? Before we answer this question, it is necessary to define our terms. So when do you prune desert bird of paradise (Caesalpinia spp., also known as "poinciana"), specifically? The red bird of paradise should be pruned in late winter or early spring. Mexican bird of paradise and yellow bird of paradise can also be pruned at this time, but these two plants should be pruned more sparingly (if at all). What About Pruning Hedge Shrubs? Shrubs used in a hedge present something of a special case when it comes to pruning, so much so that a different word is used to refer to the operation: "shearing." Often (but not always), folks looking to grow a hedge choose shrubs whose foliage display is highly valued (perhaps valued beyond their floral display) and that are especially amenable to pruning (meaning it's easy to shape them by pruning). A good example is privet. Because the goal in growing such hedge shrubs is to achieve a uniform leafy border (for as much of the growing season as possible), one doesn't necessarily put a lot of thought into pruning hedges "at just the right time"—in terms of maximizing floral display (as one does for specimen flowering shrubs). Instead, the focus in pruning hedges is more likely to be on sculpting them in a precise manner. Hedge pruning, in such cases, is generally performed whenever the branches are "getting out of hand" (i.e., when they are no longer conforming to the desired shape and dimensions for the hedge). On the other hand, if you are pruning a hedge of rhododendrons or azaleas, for example, you may wish to strike a balance between enjoying the potential floral displays such shrubs offer and keeping the hedge uniform. I.e., pruning hedges of this sort may be put on hold for much of the spring, until after flowering has taken place. Is There a General Rule of Thumb for When to Prune Flowering Shrubs? What Are the Most Drought Tolerant Shrubs? Did You Know That There Were Shrubs With Gray Berries?